The Arcana Famigila protects Regalo Island with powers granted to them the Tarocco. At birthday party for the head of the family, “Papa” Mondo, he tells them he is thinking about retirement and the Arcana Duello will begin. "I will decide my own path!" 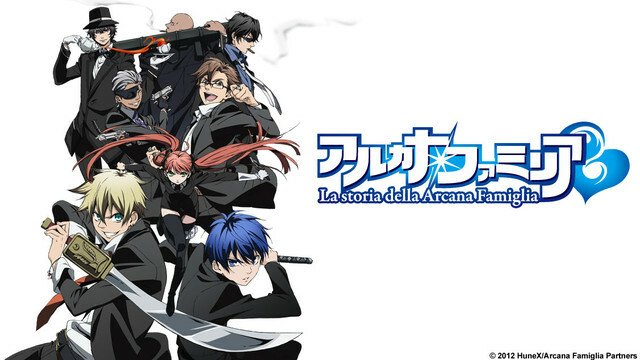 The prosperous island of Regalo in the Mediterranean Sea is protected by a vigilante group called "Arcana Famiglia." The group's members are granted special powers through contracts with the "Toracco." Felicitá, the only daughter of the Papa and head of the family, has her mother's beauty as well as superior skill with knives. Though she was raised deep in the island, at age 16 she takes her first steps into the spotlight as a member of the family. Then, at her birthday party, her father, Mondo, announces that he is retiring. He declares a competition to determine his successor - and Felicitá must marry the winner. Felicitá enters the competition herself, determined to win so that she can decide her own path. The curtain will soon rise on the battle that will determine her fate!